Compact design, high-efficiency performance and enhanced connectivity result in a durable, reliable, long-lasting subwoofer. “These new additions to the DXS lineup bring updated performance and rugged construction to offer remarkable bass response, even in smaller footprint systems,” said Nithin Cherian, product marketing manager, Yamaha Pro Audio. Yamaha today announced the DXS12mkII and DXS15mkII portable powered subwoofers, which provide clean, punchy, loud low-end to musical groups and venues requiring the highest quality bass output. Following on the success of the Yamaha DXS 18 subwoofer, the DXS12mkII and DXS15mkII are more formidable than their predecessors. These models combine a super-efficient Class-D amplifier putting out 1,020 watts of peak power (as compared with 950 watts in the originals) with a unique bandpass cabinet design. This configuration helps the subwoofers achieve remarkable sound pressure levels (SPL) from compact enclosures; the DXS12mkII and DXS15mkII are capable of a maximum SPL of 134dB and 135dB, respectively. Low-frequency response has also been improved, with the DXS12mkII going down to 42Hz and the DXS15mkII to 40Hz. Compared to the competition, the DXS12mkII essentially offers the performance of a 15'' powered subwoofer, while the DXS15mkII provides that of an 18'' unit. Because the amplifiers do not require active cooling, the DXSmkII subs can be run at high volume for extended periods and not risk the thermal shutdown or distortion issues that plague much of the competition. Connectivity has been improved as well. On the original DXS models, the XLR thru outputs simply passed the full-range audio from the inputs to any connected speakers. On the DXSmkII models, these outputs have a high-pass filtered option, meaning that all crossover work is done within the subwoofer. 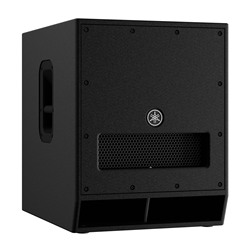 In this configuration, connected full-range powered speakers (such as the Yamaha DXR or DBR Series) can devote their full output power to amplifying only those frequencies the DXSmkII subs are not. The results are better overall projection and a more detailed soundstage across the full frequency spectrum. For mounting a full-range speaker on a pole atop the subwoofer, both models now have an M20 threaded socket in addition to the standard 1-3/8'' (35mm) non-threaded socket, resulting in increased stability. For stacking speakers directly, insets on the top of the cabinet minimize unwanted vibration in even the highest SPL-use cases. Furthermore, plywood construction decreases weight compared to the original models by approximately six pounds. "These new additions to the DXS lineup bring updated performance and rugged construction to offer remarkable bass response, even in smaller footprint systems," said Nithin Cherian, product marketing manager, Yamaha Pro Audio. "The connectivity and crossover options allow integration with almost any full-range system." "Providing extended bass that can handle virtually any gig - and be carted there without hassle - the Yamaha DXS12mkII and DXS15mkII clearly represent the loudest, cleanest, most reliable solutions on the market today," Cherian added.